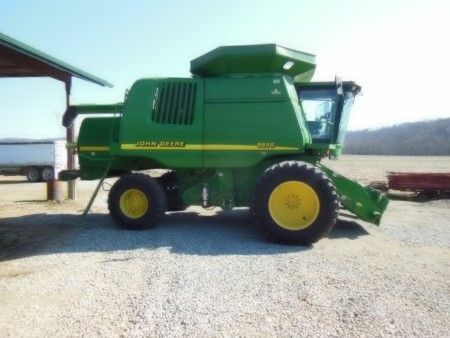 5 TRACTORS * COMBINE * 2 SPRA COUPES * TILLAGE * LIVESTOCK EQUIP * SEMI'S * TRUCK & MORE! Mr. LEO "STEVE" Paige is a 65 year resident farmer in Ross & Pike County and has farmed the same farms for years. He has decided it's time to hang up his hat, kick back with retirement and offer this clean line of equipment to the highest bidder on the premises. JD 8520 MFWD w/ front & rear duals, +/- 2003 model, showing 9,884 engine hours, auto steer with Outback S3 guidance system powered by Crescent. Tractor ID #: ROAH8SF004043, 5 AUX., clean cab, A/C, 3 pt, radio, 1000 PTO. JD 8650 4 WD Tractor with front & rear duals, showing 8,974 engine hours, Mr. Paige provided this tractor had a new engine put in and the new engine has +/- 1,000 hours on it, A/C, clean cab, A-B-C-D range 1-2-3-4, 3 aux., 1000 PTO, 3 pt. 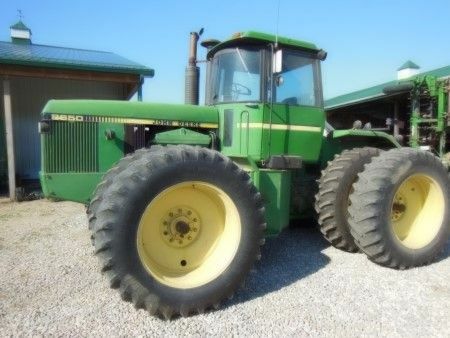 JD 4230 2 aux, 3 pt., cab, showing 6,814 hours, 18.4-34 Tacoma tires, 540 pto. FORD 4100 utility tractor with loader attachment capability (loader sold separately), showing 4,732 hours, pto, 3 pt., diesel, 2 WD. AGCO White 6144 Workhorse MFWD Clean Tractor! 2 owner, showing 3,714 hours, A/C, 3 aux, radio, 540 or 1000 PTO, front Cultor 380/85R30 tires, rear Farmstrong 18.4R42 radials, +/- 1996 model. This tractor is an addition to the sale from the neighbor Richard Chaney who has ordered this clean tractor sold to the highest bidder, this is the only addition to the sale. COMBINE: JD 9650 CLEAN! +/- 2000 model.dual front tires, 3,190 engine hours showing & 1961 separator hours showing, A/C-heat, backup cam, extender auger attachment, hopper topper, rear chopper, Outback guidance S3 system, Titan 520/85R38 front duals, Firestone R-1 radials on rear. Heads: JD 893 8 row corn head, with a lot of updates including: new rolls, chains, sprockets, and the gear boxes have been rebuilt! Single point hydraulic hookup. Only +/- 450 acres ran since these updates were completed. JD 635 Hydra Flex grain platform, +/- 35 ft., extra sickel, single point hydraulic hookup, on J&M header cart! ID #: H00635F720960. SPRA COUPE SPRAYERS: SPRA-COUPE 4660 CLEAN!!! Only showing 643 hours, Perkins diesel motor, Automatic, cruise, +/- 80 ft. booms, 400 gallon tank, wired & plumbed for GPS, ID #: AGCS4660PNU8A1154. Mr. Paige purchased this machine last season with anticipation of retiring this soon, really nice machine. MELROE SPRA-COUPE 3630 booms have been rebuilt, newer tank, has a blown engine. SEMI'S & TRAILERS: 2003 KENWORTH W900 SEMI, sleeper cab, showing 903,000 miles, tandem dual, Cat C15 motor, 1 wet line, ID #: 1XKWDB9X52J885520. 1993 KENWORTH 600 with day cab semi, tandem dual, showing 723,589 miles, standard, Cat 3406 motor, ID # ending in J592821. TIMPTE semi trailer, MFG 8/01, GVWR 29,484, 2 axels, ID #: 1TDH400282B100976, +/- 40 ft., air brakes, springs, manual SHURLOK tarp, trailer has been skinned up on one side, Mr. Paige has used it in its current condition for years. TIMPTE semi trailer, MFG 8/92, GVWR 65,000, coupler HT 50, SHURLOK manual tarp, tandem dual, air brakes, springs, ID #: 1TDH40024P3084119. GRAIN CART: Kinze 840 grain cart with PRO LOK tarp, hopper extension, Mr. Paige provides cart holds +/- 900 bu. corn, PTO driven, Model AW, ID #: 501453. PLANTERS: WHITE 12/23 no-till planter, markers, Lift & Rotate 30 transport, fertilize, model 8743, ID #: HM74300101. BRILLION-Sure Stand model SST-144, +/- 12', Veeder-Root acre counter showing 2,485 acres, ID #: 148007. TILLAGE: Great Plains UT5036 Ultra Till, +/- 36', ID #: GPA1028A. JD 335 +/- 30 ft. Disc. FERTILIZE APPLICATION: PH MFG 11 shank nitrongen applicator, newer YETTER units, +/- 700-750 gallon tank. JD Gator: JD Gator TS, 1385 hours showing, manual dump bed, rear hitch, bed liner. Augers: (2) Westfield +/- 61' 10" augers with swing away attachment, PTO. ; Westfield +/- 30 auger with electric drive motor. Gravity Bed wagon with J&M hydraulic auger. New Holland 1432 center pivot disc bine, flail machine, really clean piece. New Idea V-Rake model 4308, ID #: 000040. Sitrex 4 basket pto tedder, ID #: ST520. Bush Hog 2620 small 1000 pto bat wing mower, +/- 20'. Ponderosa +/- 16' livestock bumber pull trailer tandem axel. Priefert SO4 auto/manual squeeze chute on dolly cart. New Holland 675/275 Bushel manure spreader older. Older New Holland Super 23 silage blower. Personal Property Terms: Paid in full at time of sale cash/check; Sold in As-Is condition no warranties or guarantees; Removal within one week of sale make arrangements day of sale with seller; loading assistance by the seller day of sale. McManus BBQ onsite for eats and drinks.